Scottish First Minister Alex Salmond has said there was "no doubt" he could work with Gordon Brown to help families and businesses through tough times. His comments came after a meeting between the prime minister and the Scottish, Welsh and Northern Irish first ministers at Westminster. But Mr Salmond again said the UK Government efficiency drive would cut £500m a year off the Scottish budget. Mr Salmond was accused of turning the meeting into a squabble. Speaking after the event, Mr Salmond said: "We had a good, businesslike meeting, and there is no doubt that we can work well together to help families and business during tough economic times." Alex Salmond: "Wrong economic medicine to start cutting public expenditure"
But he added: "At a time when we are trying to save jobs, it is entirely wrong to put thousands of jobs at risk by cutting public spending in the teeth of a recession. "Official Scottish Government figures show a £500m annual cut to public spending would destroy 8,700 jobs in Scotland, right across the economy." The Holyrood and Westminster Governments have already been able to agree on several spending policy areas, such as the acceleration of cash to fund major public infrastructure projects. But the two administrations have disagreed over the UK Government's efficiency plan announced in the pre-Budget report, which aims to save £5bn over the next few years in an effort to help save the country from a deep recession. Scottish ministers argued that to go ahead with the proposal during the current economic crisis could be disastrous - a view, they said, which was shared by ministers in Wales and Northern Ireland. Scottish Secretary Jim Murphy told BBC Scotland the Scottish budget had more than doubled to £33bn since devolution. He accused SNP ministers of putting forward a worst-case scenario and trying to "dress that fiction up as a fact". "The Scottish Government believes they're the only organisation in Scotland that can't cut out some waste and bureaucracy," he said. "Politicians seem to want to fight with each other, rather than fight the recession. 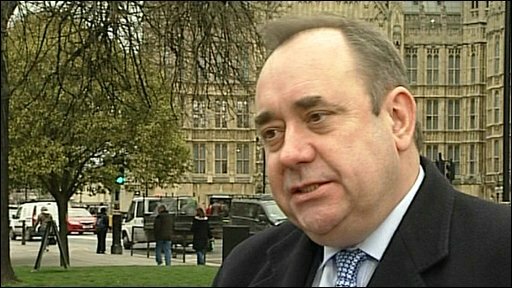 It's unfortunate that Mr Salmond, in this first meeting of its type, has chosen to turn this into a squabble between London and Edinburgh." 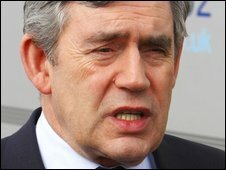 The Scottish Secretary said he wanted all the UK's administrations to join forces to tackle the recession. He added: "I want to see the Scottish Government, the Welsh Government, the Northern Irish Assembly and, importantly, the UK Government all tighten their belts in the same way that families across Scotland are doing." Present at the meeting with Mr Brown were Mr Salmond, Mr Murphy, Wales's First Minister Rhodri Morgan and Secretary of State Paul Murphy, and Northern Ireland's First Minister Peter Robinson, Deputy First Minister Martin McGuinness and Secretary of State Sean Woodward. It came as the Scottish Government stepped up calls for greater, and ultimately full, control over Scotland's finances.